Put simply, indoor air quality, or IAQ, is a measure of the quality of the air inside and around a commercial property. It is affected by a number of factors – including pollutants, contaminants, temperature and gases – and it’s becoming an increasing concern for property managers. In recent years, for example, IAQ has become more closely monitored in the construction industry, as the health consequences of poor indoor air quality have become better understood. In fact, tenant health, comfort and productivity can all be affected by IAQ. That’s why IAQ standards are being written into many of today’s green building certifications. Studies have shown that IAQ has a direct impact on employee health. According to the EPA, poor air quality can increase illness risks. Conditions like sick building syndrome, for example, can be exacerbated by poor IAQ. As a result, air quality can directly impact productivity – i.e. increased absenteeism – with the EPA estimating poor IAQ costs U.S. businesses billions of dollars each year. Contamination and interior pollution can come from a variety of sources. Water leaking into the building envelope, for example, can increase the presence of mold, which, following long-term exposure, can cause a range of health impacts. Improperly sealed windows can also increase draftiness, resulting in unfiltered outdoor air entering the building. Additionally, pollutants can be distributed through the HVAC system, if proper air filtration isn’t utilized. Biological contaminants: Mold, bacteria, viruses and pollen can proliferate in buildings for a number of reasons. Improper humidity control, inadequate ventilation and water damage can all increase the growth of harmful pollutants. Chemical pollutants: Gases and chemicals used within the building can also cause contamination. Proper filtration and air quality monitoring can prevent excessive levels of chemical particles in the air. Particles: Dust, pollen, dander and other particles can be distributed throughout a building via the HVAC system. These particles tend to collect in ductwork and HVAC equipment. Proper maintenance and equipment cleaning can prevent wide distribution. Proper Equipment Sizing: HVAC filtration and ventilation equipment must be adjusted depending on the use of a particular space. For example, turning a storage space into offices would require the HVAC system to be modified. Outdoor Air Cleaning: The location of air intake units, the filtration system’s efficiency, and the system’s ability to infiltrate enough air for dilution are all critical considerations. Space Planning: Interior spaces can affect the HVAC system’s performance. For example, locating heat-generating equipment near HVAC units can cause misreadings. 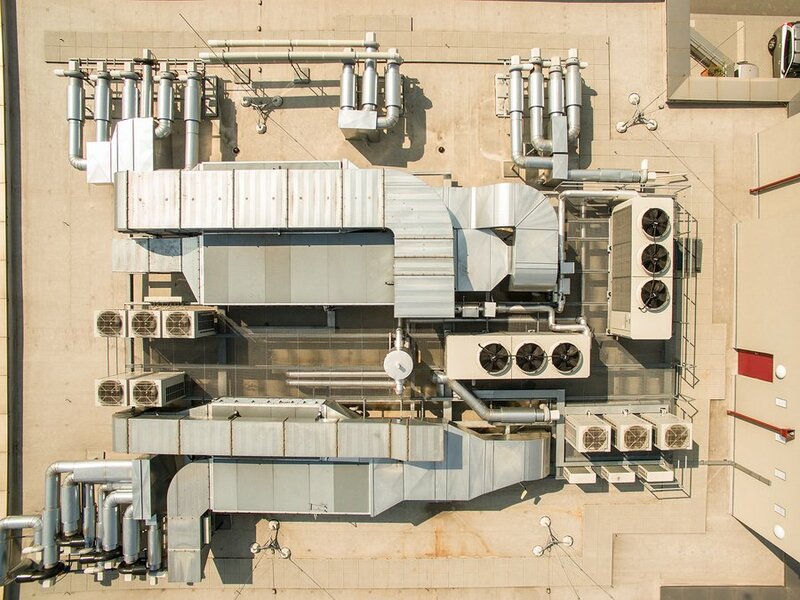 Equipment Maintenance: Regularly cleaning and maintaining HVAC equipment is imperative for efficiency, preventing pollutant build-up and long-term performance. One measure of IAQ is thermal comfort. This is the average temperature of the air, and it’s affected in a large part by a property’s windows. For example, thermal heat transfer – the amount of sun’s heat that’s transmitted through the window – can cause interior temperatures to rise rapidly at certain times of the day. Additionally, windows that are improperly insulated can result in heat being lost through the building envelope. In both cases, the indoor air quality can be impacted by inefficient windows. Yet, thermal transfer is just one way in which windows affect IAQ. Reducing reliance on HVAC systems: Installing efficient windows helps improve a building’s ability to passively manage heat. For example, south-facing, UV-reducing windows can help to limit the amount of solar heat gain. As a result, the building can reduce HVAC usage, the main distributor of particles and pollutants. Preventing draftiness: Improperly sealed windows tend to let in air and drafts from the outside. This can increase a number of pollutants that enter the building, making it more difficult to manage IAQ. Preventing water leakage and condensation: Properly sealed windows prevent water from seeping into the window frame. Over time, water damage can cause mold and bacteria to proliferate, resulting in poor air quality. Today, IAQ is receiving more and more attention, and we begin to fully understand the health consequences of poor quality air. As such, improving your building’s air quality starts with the HVAC system, including ventilation and filtration equipment. Yet additional measures like improving the efficiency of your windows can also help to improve IAQ.